Some basic concepts to be considered in the design of an automatic ultrasonic testing system for Nondestructive Evaluation (NDE) of composite structural parts in manufacturing are summarized and discussed, in particular those affecting the quality of the information obtained from the test and its ability to be integrated in the manufacturing process information flow. 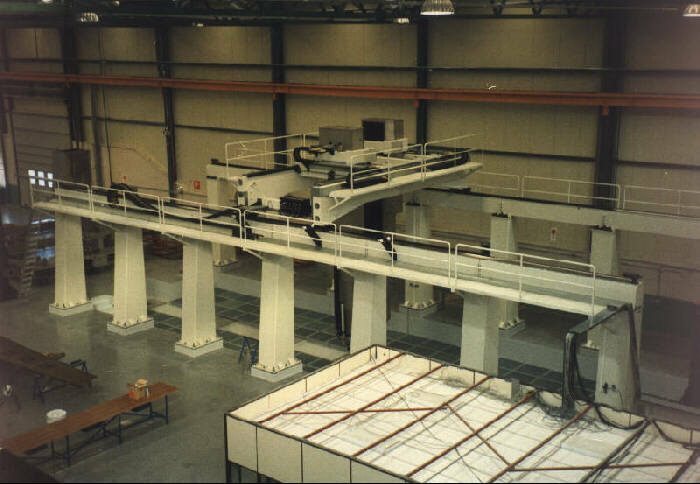 Large structural composite parts will be required for future commercial aircrafts and high performance in productivity and test reliability shall be attained at low cost. The SARA 10 system is described as a suitable solution to these goals. It features multichannel pulse-echo and through transmission, water-jet. Its robotics features up to 20 m usable stroke in length by 4.5 m in heigh. Transverse, secondary and rotary axes (up to 12 motors are simultaneously interpolated), make the system able to follow complex geometries. reduction of the amount of parts and components to be assembled from about 3000 parts in metallic structure to 200 parts in CM. The near future seems to come very fast bringing larger CM structures for wings and, later on, fusselage. The race to the 500-600 seat long-haul aircraft is about starting with the Boeing 747-500/600X and Airbus A 3XX double-deck proposals. It is also expected that Future Large Aircraft (FLA) from the new consortium Airbus Military Co.,will found its formal launch in early 1998. But before large CM primary structures come into scene a strong cost reduction all over the manufacturing process should be addressed: to improve design criteria and to cut the manpower required in the manufacturing process. ergonomic principles applied to the design of operator´s interface. This may increase the productivity of the inspection system and contribute to the reduction of operating mistakes. 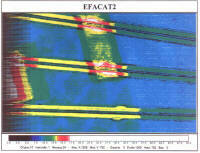 reduce the areas requiring manual scan inspection. This is addresed both at the design stage and by using flexible ultrasonic inspection facilities. increase the speed of automatic scanned areas. Use of multichannel systems greately contributes to this purpose. SARA programme is an attempt to build a solid engineering base with power and flexibility enough to adress all the before mentioned goals. SARA is a concept rather than a system as such. It makes a frame in which almost any application can be developed, from small manual or semiautomatic equipment to big, complex systems for large CM parts. SARA concept means an harmonic set of mechanics, control electronics and software subsystems working together to make an ultrasonic device to scan a part catching data according to a predefined strategy. Figure 1 shows the schematics of this structure. Most of fucntions of the system are under software control. The main menu screen is mouse driven and gives the operator access to some typical functions: axes control, configuration of each channel, programmation of the scan, remote control, etc. Acquisition software is optimized to allow real time display of the results. In through transmission, C-scan is shown on the screen of the control computer while scan is running. In pulse-echo inspection, the operator can select the type of scan (C or D) to be displayed on line. Software is currently running under Windows NT environment. The SENDAS ultrasonics electronics is used in SARA series systems. The configuration is selected for each system according to the specific requirements. Locally controlled PC bus board card is applied for portable units and small inmersion systems. However, when the distance from the transducers to the control room is long, the remote controlled SENDAS is used. This is the case of large systems, where the distance refferred to may be up to 80 metres. In the remote operated SENDAS, the main amplifier and A to D conversion are placed locally, close to the receiving transducer, so that noise level from electromagnetic sources is kept to a minimum. This makes the system able to operate at a dynamic range as high as 95 dB in a single shot. The modular design of the SENDAS system enables the use of highly specialized units. For example, electromagnetic spike noise supression of about 60 dB is achieved in only 2 shots with EMI module operating on line. Gate module allows both monopeak and multipeak detection. Monopeak mode outputs the amplitude and time of flight of the highgest echo within the gate range. Using multipeak detection mode up to 16 echoes can be detected both in amplitude and time of flight. 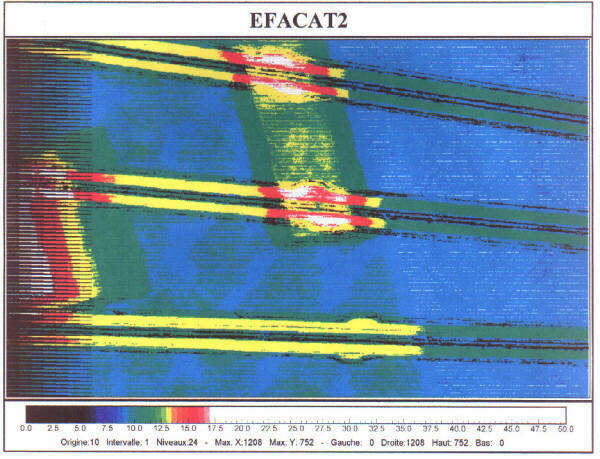 Monopeak detection is used for through transmission testing and only amplitude data are stored to build C-scan. In pulse-echo up to four gates in monopeak mode or two gates in multipeak are available for each channel. This allows the real B-scan image to be build. SARA 10 is the last system developed within the frame of SARA programme and that featuring a wider range of technical improvements. It has been designed to fulfil the requirements described in paragraph 1 above in order to carry out the ultrasonic inspection of large structural CM parts being, at the same time, highly cost effective. The basic features of this system are summaryzed below. axes 5 axes, 3 orthogonal and 2 rotating. 11 degrees of freedom. 12 motors. Figure 1 shows two views of the SARA 10 system. The operator shown in the bottom picture gives a reference about the size of the machine. The stroke of the Z axis (4.5 m) forced to a telescopic design that it appears to be used for the first time in this type of systems. This solution allows to operate the system in a workshop with only 8.5 m ceiling height. The mechanics is designed to follow complex surfaces. The central element of the control system is a Pentium PC in which bus a set of board cards are placed to drive the motors, communication with SENDAS and digital input/output. A radio modem hand-held computer is used for the remote control of the movements and manual programming. Scan programming of large parts may take hours if conventional remote control programming technique is used. Sometimes, CATIA or other CAD data may be used as the source of coordinates of the surface. However, spring-back due to internal stresses coming from the autoclave process, may be quite significant and the actual part profile may be several centimetres away from nominal geometry. In these cases a fast, accurate programming technique is needed. The solution developed for SARA 10 system makes use of a structured light source from a laser diode of 30 mwatt power output. A cylindrical lens produces a vertical plane whose intersection with the surface of the part is seen by a CCD camera placed at 45 deg to the laser beam. A video procesisor PC card makes the conversion and calculations and outputs the real coordinates of the surface. This allows to read in a couple of minutes a surface of several square metres. Complementary software tools allows the operator to cut out sourrounding data coming from supports, etc. To summarize, the time to have the file ready to calculate paths is cut to about 30 min. An important advantage of this technique is the high accuracy of surface definition so that the scan is performed under optimal nozzle-to-part distance conditions. 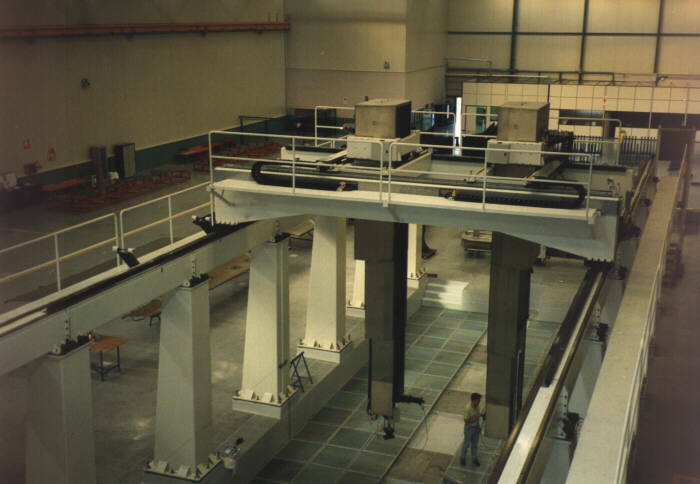 As pointed out in the introduction, there are some CM structures in which secondary surfaces (stringers, stiffeners) representing about 20% of the total area to be inspected, may absorb as much as 80% of the inspection costs, the remaining being required for the inspection of main surface (skin). Stringers lie perpendicular to the skin surface and this prevents the use of typical through transmission systems like those described above. In many cases the stringers are inspected by manual pulse echo technique and this causes both lack of reliablility and high cost. To address this problem a multichannel semiautomatic system has been developed. The transducer features 16 5x5 mm square elements placed in two rows overlaping 50% so that the width covered in one pass is 40 mm which is exactly the dimension of the stringer. This means that the complete stringer segment of about 400 mm length is inspected in one pass lasting about 5 to 10 seconds. The transducer has a perspex delay line and is 5 Mhz frequency. A-320; A-330; A-340. Horizontal stabilizers. Solid laminate. EFA . Wing and keel. CM cobonding. Diffusion bonding in titanium alloy. SAAB 2000. Multilayer adhesive bonding of aluminum alloy. F-18. Horizontal stabilizer. Complex structures. Thick metallic core sandwich. MD-11. Horizontal stabilizer. Solid laminate. B 777 flap. Very thick (150 mm) nomex core sandwich. The SENDAS ultrasonic electronics has been developed under a contract between TECAL and CSIC, the spanish acrhonyme of the High Council for Scientific Reseach, a public institution based in Madrid. TECAL wants to emphasize that the SENDAS success is due to the outstanding work carried out by the CSIC team.